VCPN VisionCareProducts.com May 2017 57 of the spectrum. ese areas in- clude 400nm, 430nm, 470nm and 505nm. Results are shown on an LED display. Lens measurements are further extrapolated into a useful protective value using the Wertheim factor (proprietary to BPI). e unit can educate pa- tients about the dangers of high energy blue light. WHERE TO FIND IT: AIT Industries, Inc. (Weco) 800.729.1959 • AITIndustries.com • Info@AITIndustries.com // Brain Power, Inc. (BPI) 800.225.5274 • CallBPI.com • BPI@CallBPI.com // Hilco Vision 800.955.6544 Hilco.com Requests@Hilco.com // OptiSource International 800.678.4768 • 1-800-OptiSource.com • Info@1-800-Op- tiSource.com // Phantom Research Laboratories, Inc. 800.225.5559 • PhantomResearch.com • Sales@PhantomResearch.com // Western Optical Supply, Inc. 800.423.3294 • WesternOptical.com • Orders@WesternOptical.com variable stirring action, a split lid and nonstick tank for heat- ing lens tinting solutions. e detachable temperature probe is immersed into the tint solution to reflect the solution tempera- ture not the temperature of the heat transfer fluid (HTF) as in conventional heating systems. Verification of tint results are easily reported using the Mod- el Spectrum 700VU unit by Phantom. e unit measures UV and visible light transmission through the lens. It measures from 320 to 400 nanometers in the UV spectrum and 400nm to 700nm in the visible spectrum. 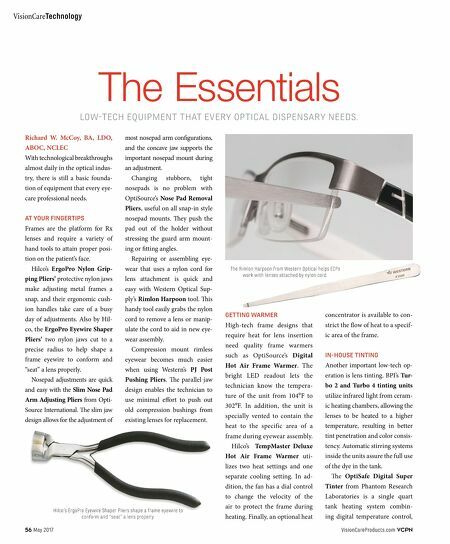 e unit doubles as a tool for educating about photochromic lenses and lens filtration. With blue light a factor in macular generation, BPI has in- troduced a UV/Blue Light Ana- lyzer to assess the filtration prop- erties of lenses in certain areas BPI UV and Blue Light Analyzer assesses the filtration properties of lenses in certain areas of the spectrum. THE PERFECT FINISH Lens finishing always plays a role in the dispensary, and the hand stone is an important piece of low-tech equipment. It is instrumental in adjust- ing bevels, shaping lenses and reducing size in addition to safety/pin beveling. 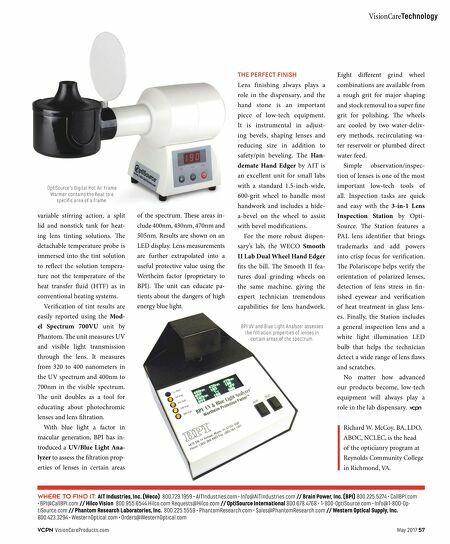 The Han- demate Hand Edger by AIT is an excellent unit for small labs with a standard 1.5-inch-wide, 600-grit wheel to handle most handwork and includes a hide- a-bevel on the wheel to assist with bevel modifications. For the more robust dispen- sary's lab, the WECO Smooth II Lab Dual Wheel Hand Edger fits the bill. e Smooth II fea- tures dual grinding wheels on the same machine, giving the expert technician tremendous capabilities for lens handwork. Eight different grind wheel combinations are available from a rough grit for major shaping and stock removal to a super fine grit for polishing. e wheels are cooled by two water-deliv- ery methods, recirculating wa- ter reservoir or plumbed direct water feed. Simple observation/inspec- tion of lenses is one of the most important low-tech tools of all. Inspection tasks are quick and easy with the 3-in-1 Lens Inspection Station by Opti- Source. e Station features a PAL lens identifier that brings trademarks and add powers into crisp focus for verification. e Polariscope helps verify the orientation of polarized lenses, detection of lens stress in fin- ished eyewear and verification of heat treatment in glass lens- es. Finally, the Station includes a general inspection lens and a white light illumination LED bulb that helps the technician detect a wide range of lens flaws and scratches. No matter how advanced our products become, low-tech equipment will always play a role in the lab dispensary. Richard W. McCoy, BA, LDO, ABOC, NCLEC, is the head of the opticianry program at Reynolds Community College in Richmond, VA. VisionCareTechnology OptiSource's Digital Hot Air Frame Warmer contains the heat to a specific area of a frame.